A wanted flyer for a suspect in two bank robberies. A Rolando-area supermarket banking desk and a credit union office several miles away were robbed in just over 90 minutes Thursday, apparently by the same distinctively attired young thief. 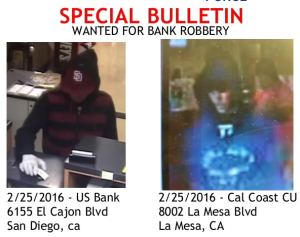 A thin man with a solitary white glove on his right hand passed demand notes to tellers at a US Bank office at a Vons store in the 6100 block of El Cajon Boulevard and at a California Coast Credit Union branch in the 8000 block of La Mesa Boulevard shortly before 11:30 a.m. and just after 1 p.m., respectively, according to the FBI. In both cases, the bandit was described as a roughly 5-foot-7 inch, 140- pound light-skinned black or Hispanic man who appeared to be in his late teens or early 20s. In addition to the glove, he was wearing a jacket with red and black horizontal stripes on it and a red baseball cap embossed with a Padres “S.D.” logo. Anyone with information about the robberies was asked to call San Diego County Crime Stoppers at (888) 540-8477. Tipsters may remain anonymous and could be eligible for a reward of up to $1,000.